Not all crimes are reported on the front page – and not all criminals are gun toting bandits. It may seem like a slow news day, but lurking on page six of the Los Angeles Times was this innocent looking advertisement for the diet drug Marmola. In the future the drug will be exposed as a possible killer! Let’s hop into the time machine and travel to 1938… The public was fed up with products that promised the world, but delivered illness, disfigurement, and death. A Senate subcommittee was formed to investigate the outrageous claims of some over the counter medications. Following the subcommittee’s recommendations, President Franklin D. Roosevelt signed the Food, Drug, and Cosmetic Act on June 25, 1938. Attorneys for Marmola challenged the constitutionality of the law. They insisted that people had the, “inalienable right of self-medication”. The judge who reviewed the case disagreed stating that the legislation was enacted to, “make self-medication safer and more effective”. Marmola toned down its claims but remained on the market. Finally in the early 1940s the FDA, believing the drug to be dangerous, seized dozens of packets while they were in transit to La Crosse, Wisconsin. The drug went on trial in Madison, Wisconsin in 1943. A young woman from Chicago came forward with a horror story that left courtroom watchers in tears. She told the judge that she had purchased Marmola because she was tired of her weight being the subject of cruel taunts by her classmates. Her excess pounds began to melt away, but she had also developed some nasty side effects. She hadn’t known that she was taking desiccated thyroid in toxic amounts. By the end of seven months she was vomiting regularly and her weight would eventually plummet to a cadaverous 50 pounds! At the time of the trial she was deathly ill with persistent symptoms of hyperthyroidism. 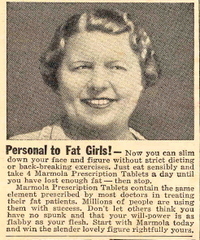 Due in large part to the girl’s testimony, Marmola was finally pulled from drugstore shelves. Diet elixirs such as Marmola aren’t quaint artifacts of bygone days. Just spend any Saturday morning watching today’s television infomercials hawking diet drugs and quack devices, each promising to transform you from a flabby couch potato to a sculpted body beautiful.